Serotonin is thought to be a contributor to feelings of well-being and happiness. It is a naturally occurring hormone in your body that can be released during happy occasions. This is the ideal gift for a science geek. The Serotonin necklace combines the geeky science with the mushy human side. The Serotonin Necklace is a white metal pendant in the shape of a serotonin molecule. The Serotonin Necklace pendant comes on a white metal chain. 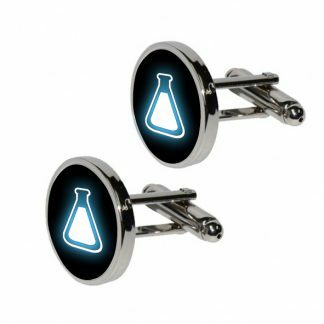 If you are looking for the perfect gift for a science geek that has everything, then look no further. This serotonin necklace comes in a black jewellery box making it ideal for birthday’s, graduations or a Christmas present. 1 x Serotonin Necklace in a black jewellery box. The Serotonin Necklace is a white metal pendant on a white metal chain. The Serotonin Necklace hangs stylishly around your neck. If you are giving this as a gift then we have fun designs of science and medical Gift Wrap to wrap your gifts. This Serotonin Necklace is part of our Science Jewellery collection.